R. M. S. Queen Mary: Brother, Can You Spare a Dime? 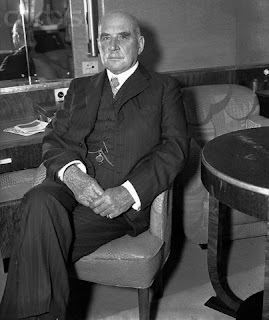 On this day in 1937, financier J.P. "Jack" Morgan, Jr. was aboard the RMS Queen Mary, on his way home to New York. The well-known philanthropist son of America's most prominent banking tycoon had traveled abroad for the coronation of King George VI. Unfortunately, he had been unable to attend due to a heart ailment. He is pictured here looking hale in a stateroom aboard the ship.